Redpack tomatoes are celebrating Carnevale with delicious Italian recipes and giveaways! 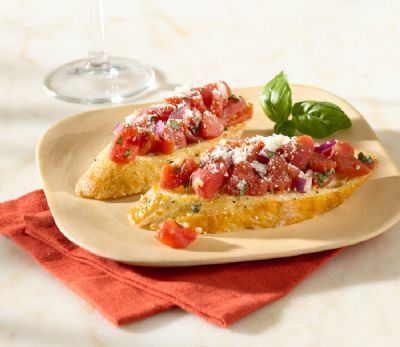 For starters, here’s a recipe for Tuscan Tomato Bruschetta courtesy of Redpack. It’s simple and easy, makes a great appetizer, and definitely a crowd-pleaser for your next dinner party. Then enter the giveaway for a chance to win a Redpack Carnevale kit! Brush extra virgin olive oil onto both sides of bread slices. Grill or toast under the broiler until golden on both sides. In a bowl combine remaining ingredients, except cheese, stir to combine. Spoon the tomato mixture onto the toasted bread. Sprinkle with Parmesan cheese and broil for 1 minute to melt the cheese. One lucky reader will receive a Redpack Carnevale kit, which contains a 28-oz can of Redpack crushed tomatoes, a 28-oz can of whole peeled tomatoes, a 28-oz can of diced, and a 6-oz can of tomato paste. Enter the giveaway using the Rafflecopter widget below. U.S. residents only. Giveaway ends on February 24th, 2014 12:00 PM ET. Disclaimer: The giveaway is sponsored by Redpack Tomatoes. All opinions expressed are my own. My husband is italian, so I am gonna make chicken/shrimp parmesan with a homemade tomato sauce. I’d love to make some chicken tacos with these yummy tomatoes! I’d make some sort of pasta dish! I would use some of them to make soups and some for pasta sauces. I would make chili for starters. I would make a good marinara sauce. i will make sauce with all of those tomatoes! I always buy my tomatoes in bulk. I use them mostly for chili, spaghetti sauce, sloppy joes, and tomato soups. I will make a yummy tomato mushroom risotto. I will make lasagna with homemade sauce. I will make spaghetti, and I will make chili. I would make chili or spaghetti. I would make a spaghetti dish or pasta dish. i would make some chili with all these tomatoes ! I’m going to make a bunch of skillet meals with pasta and veggies. I am going to make chili and taco soup. I love Redpack tomatoes and would use them in my Tuscan Vegetable Soup as well as spaghetti sauce. I’d make Spanish rice and also pasta!!! mangia!! I would make a huge pot of veggie soup. Id make my familys spaghetti sauce recipe! I would make spaghetti sauce with the tomatoes. I’d like to make some taco soup with all of those tomatoes! Spaghetti sauce, of course. And then there is Pizza and a whole bunch of other things after that. I’d make some pasta, some chutney, and probably some salsa! I want to make some chili sauce with these tomatoes if I won. I will make sauce, chili, sandwiches, etc. I’m going to make my favorite spaghetti. I would make some vegetarian chili, but i never thought of making bruschetta with it and that looks and sounds delicious! I would make lasagna or spaghetti.